Country Vet® Bug Killer Kit works automatically to kill and repel mosquitoes, flies, gnats and small flying moths 24 hours a day. Metered Fly Spray lasts 30 days. 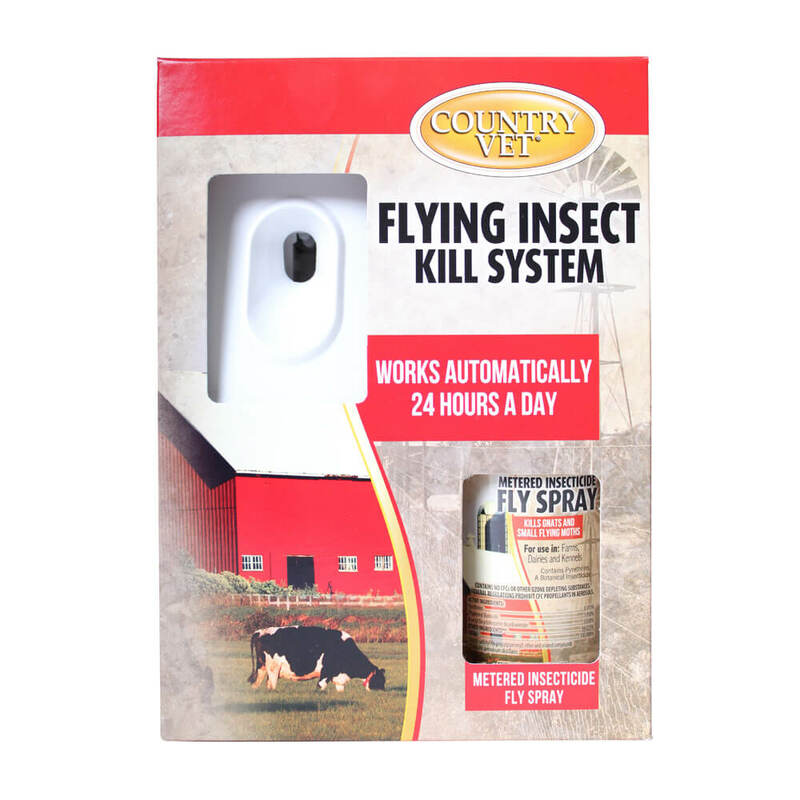 Kit includes one dispenser and one 30-day Country Vet® Fly Spray refill. The automatic stable & barn dispenser is guaranteed for 5 years. Country Vet® Fly Spray is EPA registered and USDA rated. This product can only be shipped via ground carrier within the contiguous United States. It cannot be shipped to a P.O. Box or via any expedited method that may involve air transport. If you have any questions, please call 877-813-7387. This product contains chemicals including, Ethyl alcohol, which is known to the State of California to cause cancer, birth defects or other reproductive harm. (California law requires this warning to be given to customers in the state of California) For more information go to www.P65Warnings.ca.gov. For use in: Farms, dairies, barns, kennels, milk and egg handling areas of dairies and chicken houses.This product contains highly effective insecticide designed especially FOR USE IN automatic dispensers. The dispenser activates the metered valve every 15 minutes. Usually the effectiveness of this product will be noticeable within one hour after the dispenser is activated. If less than 24 hour control is required, the dispenser should be set to start one hour before control is desired and run one hour after control is no longer needed. Keep in mind such factors as airflow rate, size of space treated, humidity and room temperature all affect insect activity and control. Therefore, one unit per 6,000 cubic feet should be considered as an average need with adjustments made depending on specific conditions at place of usage. As with any method of insect control, best results are achieved when sanitation and other positive insect prevention practices are followed. It is suggested that the container be changed once a month. Disposal: Do not puncture or incinerate! If partly filled: Call your local solid waste agency or 1800-CLEANUP for disposal instructions. Do not use in nurseries or rooms where infants, ill or aged persons are confined. Do not install directly above or within 12 feet of any food handling or dispensing area. Metering device must be timed so that it does not dispense while food processing is underway. Foods should be removed or covered in such a way as to prevent contamination. All food processing surfaces should be covered during treatment or washed with an effective cleaning compound followed by potable water rinse. HOT LINE NUMBER- Have the product container or label with you when calling a poison control center or doctor, or going for treatment. For emergency information, call (985) 878-6751, Monday through Friday, 8:00 am to 4:30 pm CST. After 4:30pm call your poison control center. For product information call (203) 597-1812, Monday-Friday, 8:00 am to 5:00 pm EST. NOTE TO PHYSICIAN- Contains petroleum distillate - vomiting may cause aspiration pneumonia. Physical or Chemical Hazards: Contents under pressure. Do not use or store near heat or open flame.